It has gotten colder and I am starting to wish for snow! In a continuation of getting acquainted with Zoya polish, I started off with three coats of Zoya Crystal. 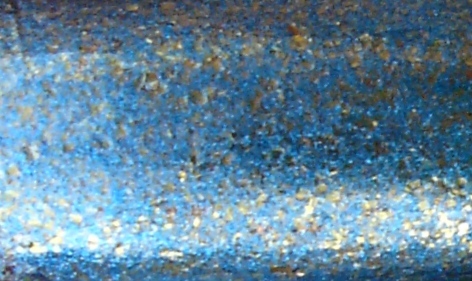 Crystal is an absolutely gorgeous light silvery blue, with a shiny metallic finish full of gold flecks. It is so pretty on its own, I actually wore it alone for a day before adding the Konad design to it! Application was very smooth, with great dry time. 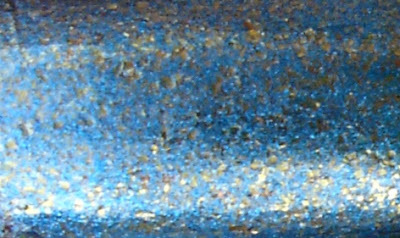 Like Gloria, this one probably could have gotten away with two coats, but three really reached full opacity. Look how gorgeous this is close up! After a day of wearing this beauty by itself, I decided it was the perfect background for snowflakes. 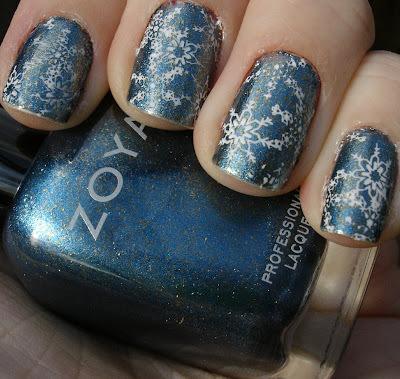 I actually went to the mall to buy the snowflake Konad plate specifically for this polish, heh. 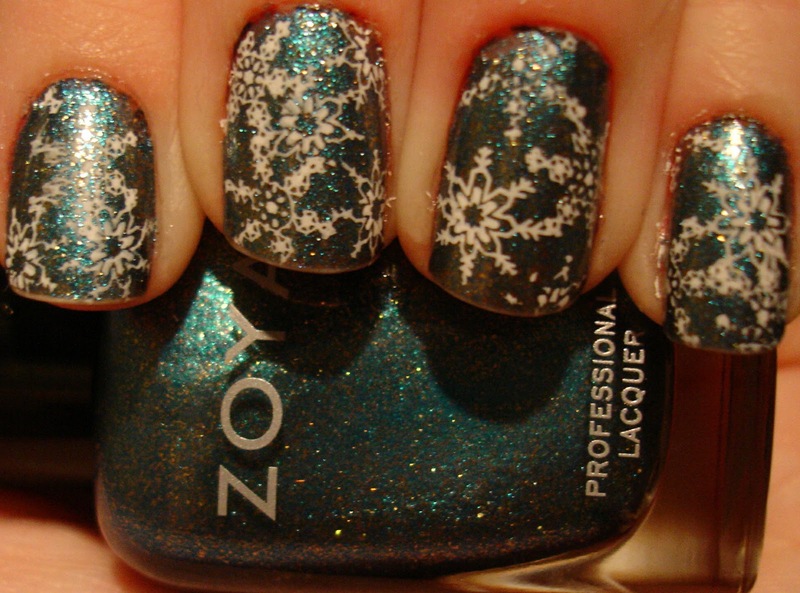 I used plate m59 and Konad Special White to add snowflakes to the nail. I debated between fully spaced apart snowflakes and overlapping, and decided on overlapping... although I am still not sure which I liked best! Indoors, artificial light - shiny! Similar to the other Zoya polishes I have tried, this wore really well during the three days I wore it, with some minor tip wear and one small chip by the end. This might be my favorite Zoya I have tried so far - and it is the reason I ignored my budget to place an order with their BOGO deal... :) A great blue to add to my collection! Strangely enough, after painting these nails it seemed to warm up a bit here. I guess that means I shouldn't expect snow anytime soon. Although you never know, the weather changes at the drop of a hat here! Next up, I will be posting my manicure with Manhattan 610K, and telling you where it is headed next! Look for it on Saturday! Such a great mani; I love the overlapping snowflakes! Icy amazingness! I love everything about this manicure. SOO pretty! Thank you all so much, I am so glad you like it! Kimberly, I like the idea that it is like a Christmas ornament, you are right! Annie - I am jealous, I love snow!